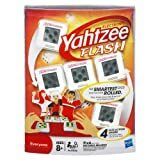 Today Word Yahtzee is a popular game with many different age groups of people. The rules are listed below. As mentioned above this game is really easy to learn. It will take you and your friends no time to pick up the rules and memorize them. However, you can take all the time you like playing the game, and feel a sense of satisfaction as you watch your self develop more finely tuned skills. 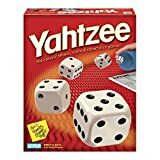 Word Yahtzee is a game that your whole family can enjoy for many years to come. It would be great for family holiday & birthday gifts . People love this game. Just be sure to provide enough supervision to small children to keep them safe. But you can find Word Yahtzee online, at toy stores, or garage sales. It is a fun and inexpensive way to engage the whole family and get people interacting. It's that simple. So grab some friends and enjoy. 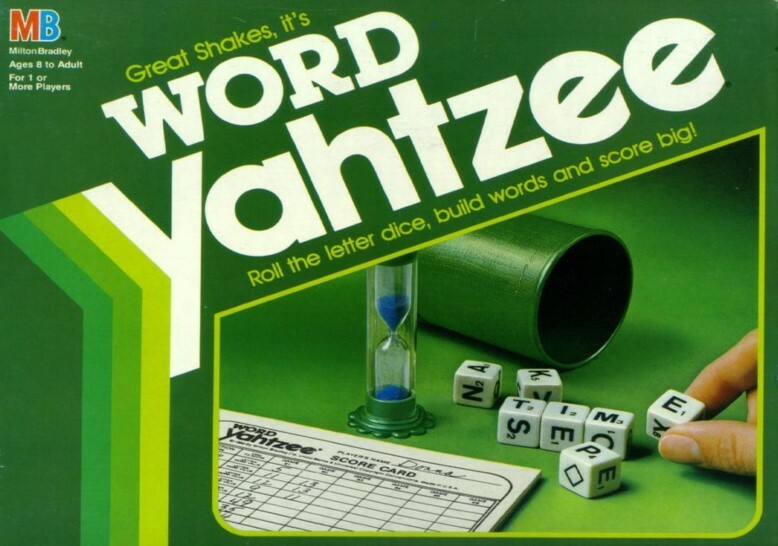 Word Yahtzee may be played by two, three or four players. It may also be played solitaire and one player tries for the highest possible score. To earn a higher score than your opponents by building high-value words. Take a score sheet and use a pen or pencil (not supplied) to keep your own score. You may roll the dice as many as three times in each turn in an attempt to make a word and earn point values. Only words found in a standard dictionary are allowed. Proper nouns, abbreviations, slang and foreign words are not allowed. There is one dice marked with a diamond. This can be used as any letter (wild) but it has no point value. After three rolls of the dice, you MUST record a score or a zero in one of the vertical boxes corresponding to the number of the round. 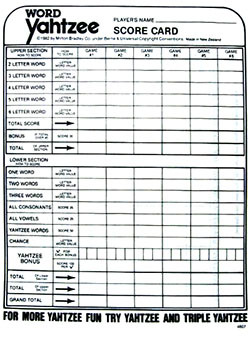 If you want to score in "All Consonants", "All Vowels", "Yahtzee Words", or "Chance" (lower section) in any round, you must record a zero in the box corresponding to that round. A complete game consists of eight rounds which must be played in numerical order. As an option, you may choose to score the eight "round" boxes in random order (not numerical or consecutive). If you use this version of play, be sure all players are aware of it before starting the game. The game ends after eight rounds have been played. Choose one player to go first. Others play in turn, clockwise. In each turn, you may take a maximum of three rolls of the letter dice (although you may stop after the first or second roll). In the first roll, you must use all seven dice. In the second or third rolls, you may or may not set aside dice that partially spell out a word and then roll the remaining dice. You do not need to declare the word, but it must be completed in that round. The wild diamond may be declared to be any letter. After the third roll, dice are final and must be scored. You are allowed one minute to complete your turn. There are 12 scoring boxes. In the upper section, there are boxes for two, three, four, five and six letter words. In the lower section, there are boxes for one word, two words, three words, All Consonants, All Vowels, Yahtzee Words, and Chance. Progress down the score sheet beginning at Round 1 and ending at Round 8. If you are playing in random order, score boxes as you play them. At any time. you may score in the "Yahtzee Words" box if you roll a seven letter word. Score 50 points in the "Yahtzee Words" box and place a zero in the round # box. All Consonants - Try to roll seven consonants. If you succeed, score 25 points in the appropriate box and place a zero in the round # box. All Vowels - Try to roll seven vowels. Vowels are A, E, I, O. U. & Y. If you succeed, score 25 points in the appropriate box and place a zero in the round # box. Chance - Score the number value of the word or words you have formed in this box and place a zero in the round # box. If you earn a score of 30 or more points in the first five boxes of the upper section. you receive a bonus of 35 points for this section. If your first Yahtzee word was scored as 50 points, you receive a bonus of 100 points for a second and subsequent Yahtzee word. Add the 100 bonus points to the Grand Total and put your score on the back of the score sheet. 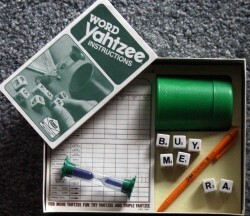 If you did not make your first Yahtzee word but placed a zero in the box, you are not entitled to any bonus points. To determine the final score, total all the points in the upper section (including any bonus points). Add the points in the lower section. The combined total of the upper and lower sections is your Grand Total. Be sure to add your Yahtzee bonus points (if you are due any) to the Grand Total. The person with the highest score wins the game. Note: Extra score pads may be purchased at better department and stationery stores.